The Medical Shower Transfer Bench offers a comfortable and safe solution for any fall-risk individuals, seniors or anyone who wants to get in and out of the bathtub safely without having to step over the tub or walk on wet tub floor. 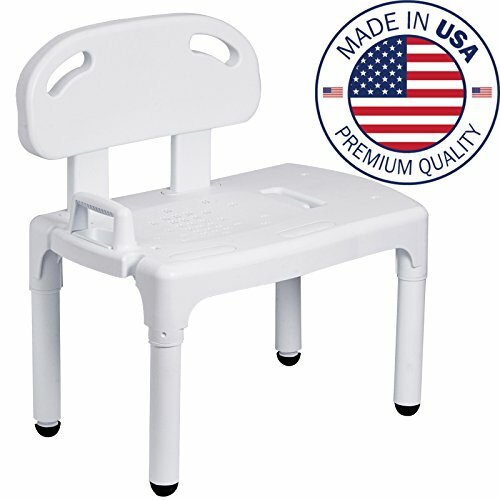 The Medical Shower Transfer Bench is a uniquely designed shower chair that allows you to remain seated throughout your entire bathing experience which means you'll not have to stand or step over your bath tub anymore. Its extended safety seat stretches out of the bathtub allowing you to simply SCOOT or SLIDE in and out of the tub safely. This is essential to avoid any accidents or falls since most falls happen when seniors get in or out of the tub. Constructed of high density anti-bacterial polystyrene plastic, this product is rust-free and highly durable. It features slip-resistant rubber feet, side support arm, patented exact level height adjustable legs, tool-free assembly, an option for left or right arm entry into the tub and a maximum weight capacity of 400lbs. It is lightweight and portable and can be taken apart easily for convenient storage or transport. Its modern design will blend in with most bathroom furnishing. WIDE CONTOURED SEAT WITH BACKREST - Textured, molded backrest with wide, non-slip seating surface (30" W x 19" D) and micro-sized drainage holes allow individuals to sit and shower in comfort. Drainage holes allow water to be effectively drained and are small enough to prevent fall-through items on the floor thereby reducing the risk of slippage.